The Argentine notches his second ever semifinal victory at a major after the top seed retired due to a knee injury. If their Wimbledon quarterfinal match was any indication of how hard-hitting, bruising this match was going to be, we were in for another epic. 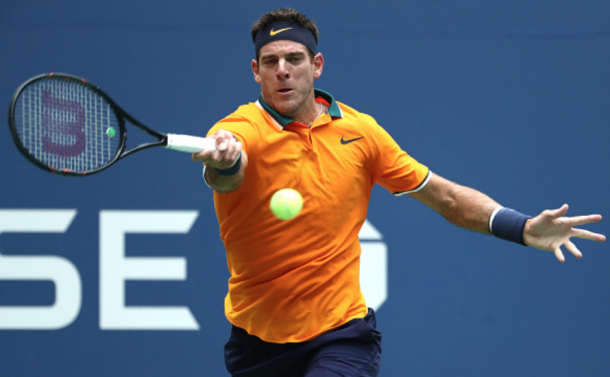 Their third semifinal meeting at the US Open and both Juan Martin del Potro and Rafael Nadal have split them with the Argentine winning in 2009 while the top seed claimed victory last year en route to a third US Open title. Two separate times, Nadal had the knee taped up but after two sets, the defending champion called it quits due to knee pain as del Potro advances to his first major final since 2009 when he won the US Open. He will face the winner of the semifinal between Kei Nishikori and Novak Djokovic. It was a tight start from Nadal who had three unforced errors in the first four points, and del Potro out rallied him to get the first break of the match. A quick break back at 15 leveled it at one-all, and the two continued to hold even when they were down in their service games - del Potro was down 0-30 in the sixth game before winning four straight points. Nadal got his knee taped up on the changeover at 4-3, and a forehand into the net gave the third seed two break points for the chance to serve for the first set. The dominant forehand blows opened up the court for the Argentine breaking for the 5-4 lead. The top seed was visibly frustrated with how poorly he played that game, but his tremendous defense drew an error from the Argentine on set point with del Potro hitting wide going behind the Spaniard. A second set point evaporated after the third seed hit a short forehand into the net. A couple more unforced errors later, Nadal broke back to level the set at five-all and that swung the momentum towards the Spaniard who then moved to within two points of the opening set, but del Potro forced the tiebreak in this opening set. Both players traded mini-breaks early on, but it was del Potro who got out quickest to a 5-3 lead despite having a net cord going against him at 3-1 up. Nadal missed an open court forehand just wide handing the Argentine three more set points. The Spaniard hit a backhand into the net as first blood went to the Argentine. While del Potro was holding quite comfortably, Nadal battled to hold serve saving two break points to start the second. After the medical timeout to get his knee taped up once again, it began to look bleaker and bleaker for Nadal. He was broken again and looked to be limping. Down 1-4, some call was made by the linesperson before Nadal hit the ball. The top seed went up to chair umpire James Keothavong and said something along the lines of, "It's all right, I'm going to retire, but you were not right on this one." Those words and body language of resignation are something you usually don't see out of Nadal, but you can't do much when your body has let you down. The sting on Nadal's shots just wasn't there anymore, but even after dropping the second set, the Spaniard chose to sit down and see the trainer once more before calling it "No mas."